Click HERE to download the interview. Canadian Journalists for Free Expression (CJFE) mediated a meeting between some members of independent media and the Montreal Police on September 21st, to bridge existing disputes between the two groups. 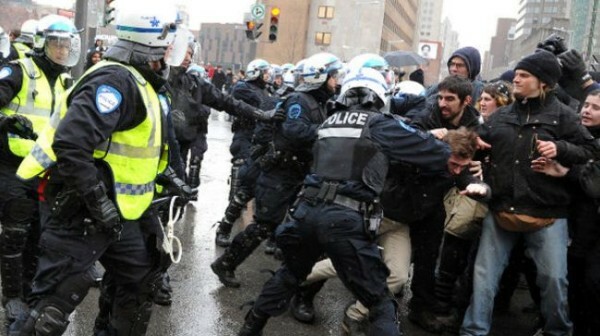 At Montreal demonstrations and rallies, the police have often been acting aggressively towards the protesters, kettling and using force on them. The journalists have been victims of attacks as well if they happened to be indistinguishable from the protesters and looked unconvincing to police. Although members of the police portray violent accidents as simple misunderstandings, their forceful acts restrict journalists’ rights for free expression and oftentimes result in physical damage. CJFE brought the two groups together for a possibility of establishing ground rules of conduct lest further instances of brutality occur. CKUT’s Kateryna Gordiychuk talked with Tom Henheffer to find out more.